Today’s chat is all about hydrating the skin – and how we can achieve that. It is all about moisturising the body externally and internally. So while I was thinking of how I could bring these two together into one blog, my mind was boggling but not for very long. I did promise a small makeup chat in my last post, so here we are as promised I decided to merge it into my weekly foodie chat. Maintaining Healthy Skin is so important and in order to do so it is imperative to take good care of it. Our skin is as we know the largest organ in the human body and the first defence mechanism acting as a barrier against invaders (nasty ones) to the inner organs. So protecting the skin is crucial in order to keep and maintain us healthy both inside and out. It is important to provide our skin with the nutrients it needs to build a strong and healthy barrier. The good news is you can look good by hydrating the body both from inside and outside and also by using the appropriate moisturising products on your skin. The two together makes the perfect recipe in maintaining healthy skin. Moisturising is an essential part of any skincare routine and dry skin can be a problem that affects many people either occasionally or chronically. A healthy moisturizing routine is the best defense against this affliction. As we merge into warmer weather, we tend to perspire more and our skin looses a lot of moisture while this happens. One of the key factors for a healthy looking skin is good hydration. For that reason it is important to re-hydrate the skin, and to do this is not just about putting make up on, but most importantly to drink plenty of fluid. Looking after the skin takes more than just a good cover up for the skin. In my last skin care blog I mentioned using Coconut oil as a skin cleanser and a skin moisturiser. As much as this remain one of my favoured moisturising agent I also like a good make up to enhance my skin texture and the very much needed feed for a good and glamour look. I don’t hesitate in admitting that I also like wearing makeup regularly. I have very delicate skin so choosing the right skin products both for my face and rest of my body is very important. For that reason I need to use things that not only enhance my look but more importantly products that suit my skin. Today the part of the body I intend to talk about is face makeup and moisturiser. I have chosen another one of my favoured face skin products, “Bobbie Brown Tinted Moisturising Balm”. I have used this product for a while now and I have been very happy with it. For that reason I have decided to share my personal experience. I find this moisturiser great for my combination skin type and I can use it most of the year but a little more in the summer period. It does not just hydrate but also gives a very natural finish, fresh look and instant shine to the face. Bobbi B Tinted Moisturising balm gives good coverage yet keeping that healthy, makeup free look. I find my skin feel very radiant without the feeling of heavy weight make up on my face with the bonus of staying on throughout the entire day with long term moisturising. A very light layer add instant luxurious glow to the skin, followed by a touch of powder to set the balm. As mentioned earlier I am only speaking from my personal experience on this product. It provides me with that easy subtle makeup I long for everyday on my skin which makes me feel good. And when I feel good I keep my smile as much as possible…. Moving onto food or rather drink this time I have a refreshing drink to quench your thirst and keep you hydrated. Many people see Aloe Vera and think medicine, exactly what I used to think. But my father was a big fan of this humble gel, which we grew in our home garden in Mauritius. As I am writing this I can almost hear my papa whispering…..as my “pa” called it “Ayur Vera” instead of Aloe Vera, we never asked him why…. maybe he thought of Ayurvedic medicine, I don’t know. But he said it with a fine tuning tone in his voice, many of you who knew my papa will relate to this……..and know exactly what I mean. I love Aloe Vera drinks as I find that it has all the natural health benefits. Aloe Vera is crisp and refreshing in flavour, perfect for a summer afternoon drink. I wanted to keep it simple by making my own refreshing drink. 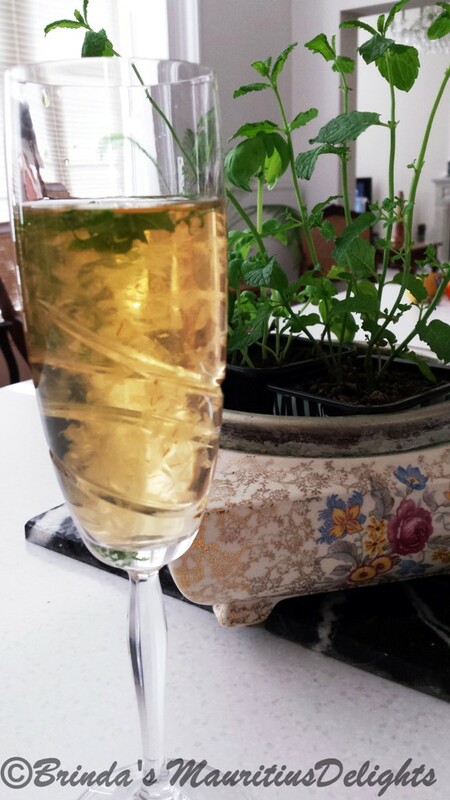 As I love the taste of lime and mint, I decided to put them together with the Aloe Vera. With a handful of ice it makes a cool and healthy drink to enjoy! There is one for you to try, and I bet you will not be disappointed. This is great to serve anytime in the day Aloe Vera gel and mint leaves floating inside the glass will be a real eye catcher. 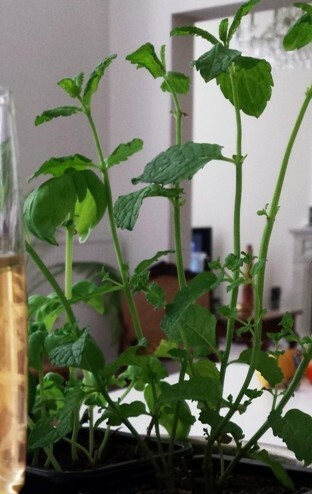 Put the mint leaves into a tall glass or flute add the sugar. Gently crush the leaves with a spoon with the sugar. Add the crushed ice. Fill the glass with Aloe Vera juice. Stir gently and dress with a couple whole fresh mint leaves and slice of fresh lime. As simple as that, enjoy this refreshing healthy drink……….